The foundation of modern Mumbai’s eating out culture is believed to have been laid when the Irani cafes were set up a century and a half ago. The ‘cabin’ restaurants of Kolkata came up roughly around the same time and some would say that they play a similar role in the development of Kolkata’s restaurant scene. These restaurants were referred to as ‘cabins’, pronounced as ka-been in Bengali, after the plywood partitioned curtained cabins which they contained. This was at a time when the Indian society was quite conservative and when ‘respectable’ women were not meant to be seen in public. These cabins enabled women to eat out with their families and yet be away from the public eye. The cabin concept was not unique to Kolkata and other cities including Mumbai had them too. 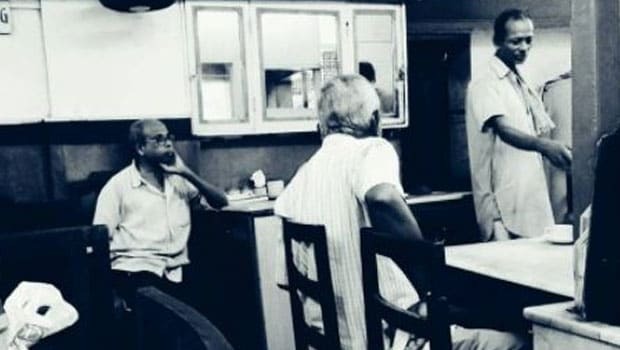 In their heydays, the cabins in Kolkata were also known to be quite popular with folks who would come to watch theatre in places such as Bhowanipore in South Kolkata and Haathi Bagan in the north. Most of those theatres do not exist any more and like the Irani Cafes of Mumbai, the cabins of Kolkata are dwindling in number too. I remember a few restaurants which had cabins during my college days in Kolkata in the mid 1990s. These included Nizam’s at New Market and Chung Wah outside the ABP office. These cabins were sought after by both families as well as by couples back then. One of the reasons given for the cabins shutting down over the last few decades is the fact that couples spent hours there over one soft drink or a shared biryani which was not good enough for business. After all, these places didn’t have the mark-ups that coffee shops have today. Most of the legendary cabins of my time, barring the odd South Pole (now shut) at Gariahat, were located in north Kolkata. North Kolkata is the older part of the city while the southern region of the city is newly developed. There was a bit of a north-south divide in Kolkata back then. If you were a south Kolkata boy in the 1980s and the 1990s (like I was), then you would hardly go to the north side. The sheer idea of travelling to north Kolkata was daunting given the traffic on the roads and the long bus ride with multiple changes. #Kolkata #StreetFood The legendary #AnadiCabin in #Esplanade . The #MughlaiParatha here is still quite good. Things changed for me when I went to Presidency College in central Kolkata in the mid 1990s and when the Kolkata Metro linked north and south Kolkata. I finally got to go to the famous cabins of College Street and the office para at S N Banerjee Road. While they retain the word ‘cabin’ in their names, most of these restaurants have actual cabins any longer. The cabins have been removed and the seating has been made open. These restaurants are small places which are not air-conditioned. If you are alone, you might have to share a table which is a great way of meeting fellow food lovers. Don’t expect to find a toilet and definitely do not look for free wifi! The cabins might have gone but the menu still remains the same at these places. You'll find deep fried dishes that came into the fore during the time of the British like chops, cutlets, Moghlai parathas, stew, toast-butter and tea. The food is still served on white porcelain plates along with a knife and a fork and a dash of kasundi or local mustard on the side. The popularity of food in these restaurants is driven by taste and taste alone. You do not go here looking for gluten free, vegan, keto-friendly or oil-free food. The high turnover of diners ensures that the quality of what you eat is dependable despite the humble surroundings and the food being so affordable. I'm sharing a list of few cabin restaurants that you can start your explorations with. If you have any favourites, do share. This 92-year-old establishment was founded in 1925. Its founder, Balaram Jana, is known to have named it after his son Anadi. It is now run by the third generation of the family. I visited this place seeking out the Mughali parathas that Anadi is known for. The Mughlai parathas of Kolkata are usually available at such small restaurants. Unlike kathi rolls, Mughlai parathas are rarely seen in street food stalls. The paratha is made with a maida dough which stuffed with a mix of minced meat and eggs. The paratha is then deep fried in a kadai. Mughlai parathas are traditionally eaten with a dish of cubed potatoes called torkari (stir fry) and a cucumber salad with a liberal dose of ketchup on the side. This 115-year-old institution is now run by the fourth generation of the same family. Its clientele ranges from those who study in nearby schools and colleges as well as traders who run shops selling books and saris. Places such as Dilkhusa and the nearby Putiram sweet shop (of dal puri and white mishti doi fame) were part of the exciting discoveries that I made during my college days. Dilkshusa still had cabins when I was in college though the cabins are no more there. One of the most famous dishes here is the Spanish croquette something-like egg devil. A boiled egg is sliced into two and then encased in a spiced mashed potato casing, wrapped in a bread crumb mix and egg batter and finally deep fried and served hot. The one with a minced meat or fish filling along with the mutton cutlets are also crowd favourites. The 107-year-old Mitra Café is head quartered in Sova Bazar and it has a few more outlets now across the city. The restaurant was founded in 1910 and is run by the grandson of the founder. You must try the Chicken Kobiraji here. The Chicken Kobiraji of Kolkata is a cousin of the Parsi cutlets of the Irani cafes of Mumbai. Both are possibly British Raj influenced dishes. Both consist of a stuffing of spiced chicken, mutton or fish, covered in an egg batter, which is then deep fried. The delicate, lace-like egg coating in the Parsi version led to the name ‘cutlets’. The egg batter in the Kolkata version is thicker, oilier and crunchier and can often dominate the taste of the stuffing inside. The word ‘Kobiraji’ is supposed to be a Bengalification of the word ‘coverage' according to some sources and is a reference to the full bodied egg batter covering. Allen Kitchen is located opposite the Mitra Café outlet at Sova Bazar. This 130-year-old establishment was originally located at Chitpur. It is said to have been started by a Scottish gentleman named Allen. He then handed over the restaurant to his Bengali staff and their descendants run it now. When you enter Allen, you walk past avuncular chefs who have been working here since their childhood. You will see them frying the chops and cutlets that would then be served to you on marble topped tables in a tiny room inside. Kaniska Chakraborty, a fellow food lover and friend, strongly recommends the prawn cutlet here. The crisp, ghee fried maida (refined flour) batter is very subtly spiced and the prawn inside it is very juicy. Kalyan loves to eat and he loves to talk about all that he eats. His wife urged him to start writing about it, otherwise she would have to hear it all. He blogs as 'finelychopped' and is the author of The Travelling Belly published by Hachette Publications.